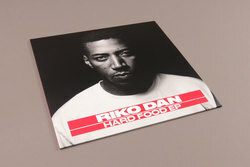 Riko Dan - Hard Food EP. Vinyl EP. Bleep. While Riko Dan’s chops are undisputed at this point, he doesn’t get the credit he deserves for his dexterity and ability to move between production styles with ease. Nowhere is his versatility more apparent than Hard Food. Whether he’s putting pretenders in their place over the dubstep-indebted production style of Joker (‘Hard Food’) or Mumdance’s tense, minimal grime (‘Hungry’), the London City Warlord handles everything thrown at him here. A unifying air of techiness makes this a drop worthy of Tectonic’s hundredth release.